A grand gala was held in Beijing on Friday evening in celebration of the 40th anniversary of China's reform and opening up. Xi Jinping, Li Keqiang, Li Zhanshu, Wang Yang, Wang Huning, Han Zheng and Wang Qishan were among the Communist Party of China (CPC) and state leaders who joined more than 3,000 people to watch the gala at the Great Hall of the People. On the balcony of the 2nd floor of the hall hung a banner, which read "rally closely around the CPC Central Committee with Comrade Xi Jinping at the core, hold high the banner of socialism with Chinese characteristics, follow the guidance of Deng Xiaoping Theory, the Theory of Three Represents, the Scientific Outlook on Development and Xi Jinping Thought on Socialism with Chinese Characteristics for a New Era, and unceasingly advance reform and opening up in the new era". 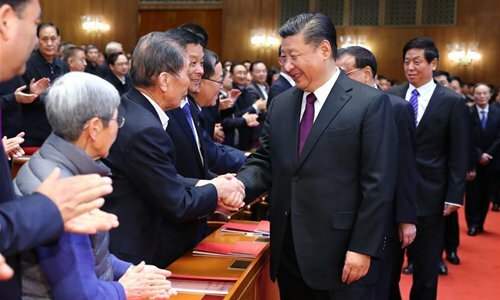 At 7:55 p.m., Xi and other senior leaders walked into the hall, shook hands with representatives of people awarded for their outstanding contributions to reform and opening up, amid warm applause throughout the venue. Named "Our 40 Years," the gala was divided into Overture, Part One, Part Two and Epilogue. Part One replayed the grand changes that have taken place in China since the beginning of reform and opening up. The part culminated with a poetry recital titled "The Great Awakening," which expressed Chinese people's gratitude and admiration for reform and opening up. Part Two comprehensively showed how socialism with Chinese characteristics entered the new era under the guidance of Xi Jinping Thought on Socialism with Chinese Characteristics for a New Era. The gala ended with a song expressing the promising future for reform and opening up. Through art forms such as singing, dancing, plays and poetry recitals, the gala gave full expression of the determination and confidence of the Chinese people to carry out reform and opening up all the way under the strong leadership of the CPC Central Committee with Xi Jinping at the core.